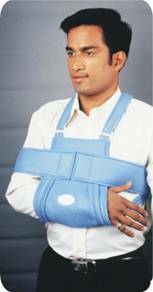 Sling and Swathe is Constructed from lightweight and durable foam laminated fabric mesh for extra protection and comfort. Easy-to-adjust design with criss-cross straps fits most comfortably at proper locations. Features detachable swathe also can be used alone as an arm sling. Fits either right or left arm for male or female patients. 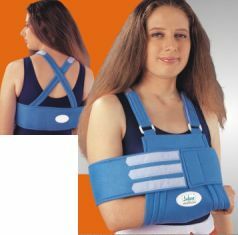 Sabar Sling and Swathe - A unique support guides and centers the gleno-humeral joint, provides complete and effective immobilization to shoulder and upper arm and promotes healing. Ideal to use incase of fracture, strains, sprain and other injuries.